In the run-up to Ireland’s Six Nations opener against France last year, French fly-half and teenage sensation, Matthieu Jalibert, was cited as a potential wunderkind. The then 19-year-old Jalibert was only the second teenager in championship history to start at fly-half, and the youngest player to partake in the tournament in almost 50 years. The previous holder of that accolade was none other than Trinity and Dublin University Football Club (DUFC) alumnus, William ‘Billy’ McCombe. He earned his first cap for Ireland in January 1968 against France in what was then known as the Five Nations Championship. Despite falling 16-6 to Christian Carrère’s men in Colombes, McCombe scored all of Ireland’s points that day. The Bangor man was something of kicking wizard in his days for DUFC, a former teammate and Trinity professor, Dr Gerald Morgan, described him as “the sweetest kicker of a rugby ball I have ever seen”. With such promise at club level, one could safely assume that an international call-up was not too far away. However, McCombe was the Joey Carbury of his day, as he went on to merely become the understudy to fellow Ulsterman, Mike Gibson. Gibson, regarded as one of the greatest rugby players of all time, was the world-class player in an otherwise unremarkable Irish side. As a result, he had a virtual monopoly on the number 10 shirt. This changed as Gibson became injured heading into the 1968 Five Nations, opening the door for a new, exciting player to take his place. McCombe’s impressive form for Trinity was rewarded on January 27, when he started at out-half for the Irish in Stade Olympique Yves-du-Manoir. McCombe’s time in the green shirt was brief – 5 caps and 32 points – but memorable as he played a vital role in Ireland’s attempt to win a Grand Slam in the 1975 Five Nations. He scored a try in a famous victory over the English in Lansdowne Road. His stand-out performance came against Les Bleus, scoring 13 points in a memorable 25-6 victory. Victories over their two bogey teams were not enough for Ireland, as they fell 20-13 to Scotland in Murrayfield and finished the tournament with a 32-4 drubbing at the hands of the Welsh in Cardiff Arms Park. McCombe never played for Ireland again after the 1975 Championship, but he left a lasting legacy during his time with DUFC. At a time when interprovincial games were merely seen as tokenistic affairs, club level was the main focus of most rugby fans. As rugby was still an amateur sport, club spirit and player loyalty were key elements of the game. Players such as Willie John McBride togged out for their team every weekend, with international and Lions duty being the only excuse for absences. Therefore, McCombe’s prowess at club level was far more significant than it might first appear. With such a high level of competition, to be regarded as one of the best players domestically was an impressive achievement. In particular, it was McCombe’s superb technical ability that garnered praise. Reporters often cited his kicking as his biggest strength. 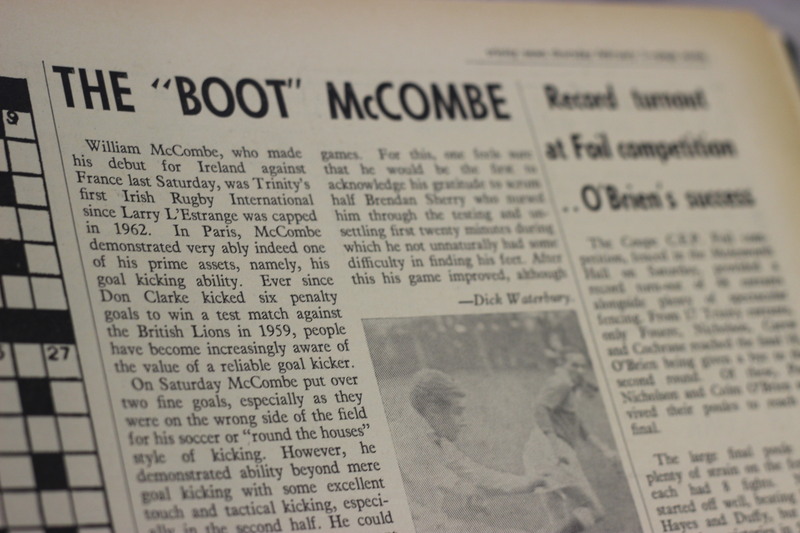 In a match report in Trinity News dating from January 1970, McCombe scored a match-winning drop-goal against Bective Rangers in a wet and miserable contest at Donnybrook. The playing conditions were described as “a quagmire of a pitch” and that McCombe’s game-winning kick was heralded due to “what was then a very heavy ball”. Today, his name may only be mentioned as a piece of fun trivia, but Billy McCombe was a star of the domestic game during his college days. Back then, international rugby was not the full-time job it is today, and the privilege of donning the green jersey was only afforded to those who demonstrated their passion for the game. McCombe also had to compete with the legendary Gibson for a place in the Irish team. While DUFC alumni such as Malcolm O’Kelly and Jamie Heaslip deserve the praise they receive, it is important to acknowledge Trinity’s first true rugby superstar: William ‘Billy’ McCombe.